One month! 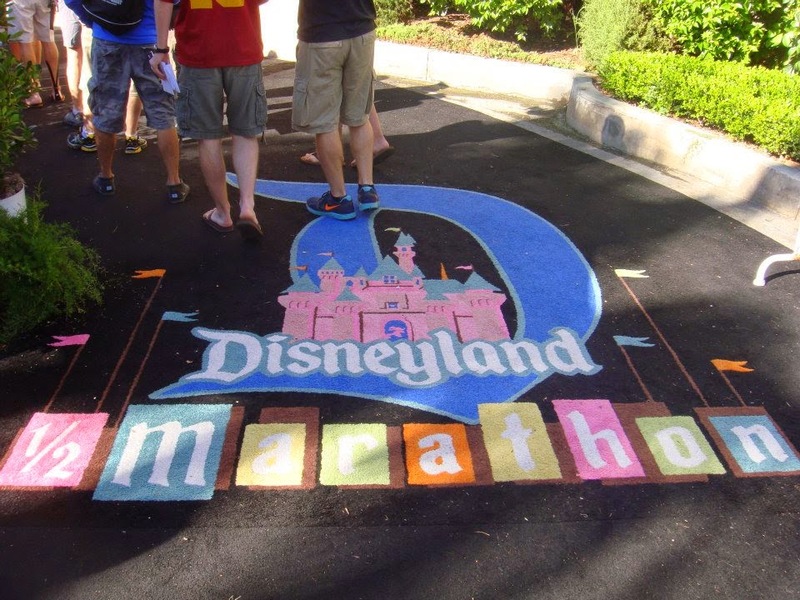 Here we are, just one month away from the West Coast race that started it all: the Disneyland Half Marathon Weekend. 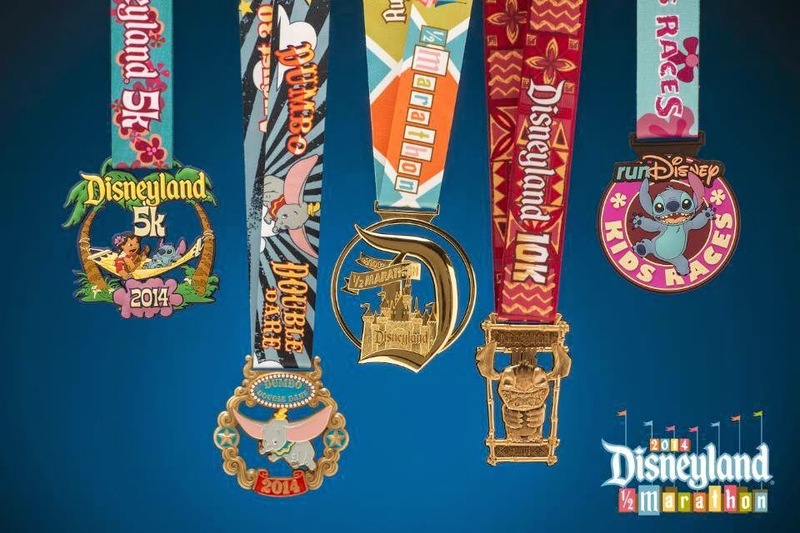 For me and the hubby, this will be our 5th Disneyland Half Marathon and 2nd Dumbo Double Dare. Chris and Katie have run twice, and Joann, she's our first-timer for this trip. With this much experience under our running shoes, we thought we'd take your questions on Twitter, Facebook, and Instagram. (By the way... do you follow us on those platforms? Get to it!). So... here we go! What you're all dying to know! 1. Where do runners meet prior to entering their corrals? The start is on Disneyland Drive between Magic Way and Paradise Way, right outside the Disneyland Hotel. Trust me, when you arrive there will be no missing the hoards of people headed to the start. You must line up according to the corral on your bib. Usually the first few corrals are lined up right in front of the start line, but later corrals wind around. Just follow the signs and you'll be good. 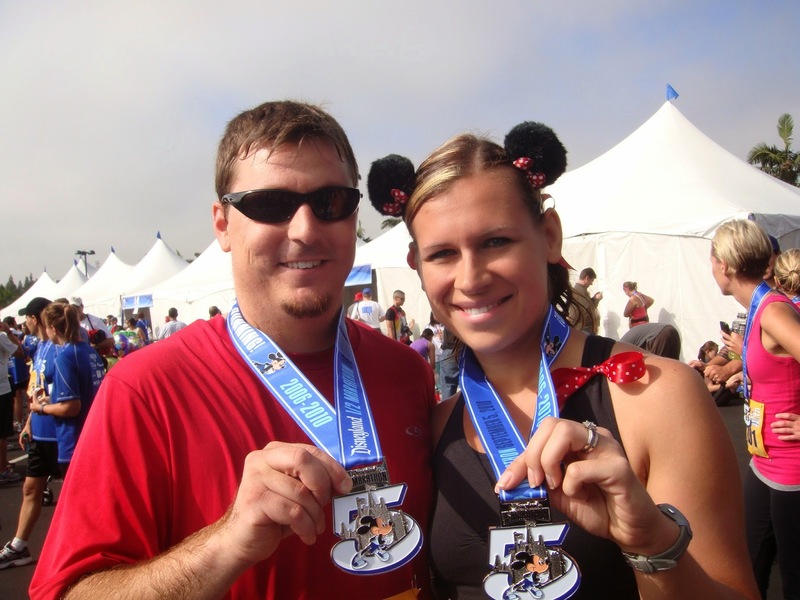 runDisney policy states that you cannot move up to a higher corral, however you can move back if you want to run with a friend. 2. What time do runners usually arrive? All of the races (except kids races) during this year's Disneyland Half Marathon Weekend start at 5:30 am (yep, it's really that early). As a runner, you will want to arrive at the pre-staging area by 5. Unlike some other races, Disney usually goes off right on time--no delays. Expect the sky to light up with fireworks at exactly 5:30. If you are checking a bag, you must have it checked no later than 5:15, but I've found that checking a bag is really simple and organized. You must use the clear plastic bag provided to you during the expo. Give yourself time, though, because the pre-staging area is HUGE. If you're anything like me, a trip to the port-o-potty is a must, so leave time for that too. I personally think if you are in your corral by 5;20, you're good, but be warned--it's like cattle being herded into narrow walking spaces. It takes time! Remember, the corrals are let off one by one, so if you are in the later corrals, you have more waiting to do. One last note, be sure you have enough time to get from your hotel to the staging area, and if you're driving, account for traffic and road closures. 3. What is it like to do the races alone? I have had the privilege of ALWAYS being at these events with family, however I almost never run with them. If your family isn't on board, meet up with some friends and make it a no-family trip! Plenty of people do that. In fact, I may be meeting up with a friend I haven't seen in over 10 years at a few upcoming races. Don't have friends who want to run with you? First, ask around! I actually have a great friend that is doing the Star Wars 10k for her first race, and another who might (c'mon Shannon... do it!) do Tink. Wanna know a secret? I've even asked my husband if he wouldn't mind staying behind--I would love to do a "friends only" weekend. I've met so many people online and in person through runDisney and would love to have a runDisney geek-out weekend! 4. My hubby and kids are coming to watch. What are their options? ﻿﻿ First you have the option of purchasing ChEAR Squad packages for your family. You can find out more about those on the runDisney website. There's no need to do that, though. There are plenty of places where you can watch for free! First, the starting line is a sight to see: characters, music, fireworks. You definitely want them at the start. Then I would suggest moving to the area between Disneyland and DCA. The runners run straight through from one park to the next. That's usually around mile 2-3, so that leaves time for them to get some breakfast in Downtown Disney before heading to the finish line (which is right by the start). They get to see you 3 times without much walking. Couple of tips: be sure they know your pace and the expected time you'll be arriving. Yes, I'm even going to suggest that you carry your cell phone and call ahead to be sure you are both clear as to where to meet. Have them wear distinguishable clothes so you can pick them out of a crowd. Signs, balloon, noise makers, whatever they can think of to stand out in a crowd. For little ones, definitely take the stroller; remember, it's early! If anyone wants to get more adventurous, all parts of the course are open to spectators except the parks and stadium. 5. Is the course hilly? Not really! Great news, right?!?! There are a few overpasses that feel like mountains compared to the flat rest of the course. I think the worst part is right after the Honda Center where there is a narrow dirt path. Please, please, please, be cautious in this area and exercise ALL runner etiquette. 6. Is there something special you need to do to get into the Dumbo Double Dare? When registering, the Dumber Double Dare is it's own race. You have to register for the Dumbo Double Dare to qualify for the special challenge medal. If you just register for the 10k and Half, you will not get the DDD medal. Note: DDD is the first thing to sell out, so you have to be ready to go right when registration opens, usually about 9 months prior to the race. The alone part....you're really not alone. You're with thousands of other runners. Most of the Anaheim runs I've done I've had running buddies, but I did WDW by myself. I certainly never felt lonely, and I'm not really a social person. It's just a big party.